Federal trade officials asked representatives for Suniva and SolarWorld to justify their request for tariffs on imported solar equipment on Tuesday, marking the latest step in a case that threatens to upend the U.S. solar industry. The 10-hour hearing at the International Trade Commission in Washington, D.C. drew dozens of solar industry leaders, foreign diplomats and activists sporting t-shirts that read, "Save America's Solar Jobs, No New Solar Tariffs." Executives for the troubled solar manufacturers told the agency’s four commissioners that tariffs and price minimums are needed to revive their industry, which has been crushed by cheap imports from Asia. “Quite simply, we need the commission’s help to save solar manufacturing in the United States,” said SolarWorld CEO Juergen Stein. The companies are calling for duties of 40 cents per watt on imported cells and a floor price of 78 cents per watt on modules. If the commission approves the request, it could destroy 88,000 jobs in installation, sales and construction, according to estimates by the Solar Energy Industries Association. “What would you recommend might help the broader solar industry?” asked Commissioner Meredith Broadbent. Solar trade case watchers will be paying close attention to Trump's comments on jobs and the broader economy, as the final decision on whether to provide import relief, and the amount of relief, could end up being his. 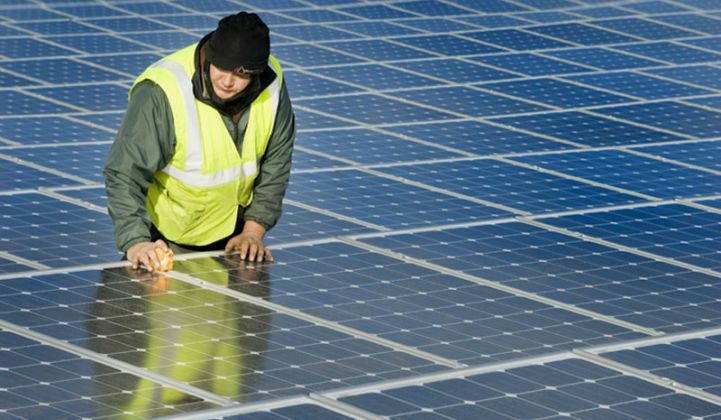 Suniva and SolarWorld have refuted the SEIA’s job predictions, pointing to an economic analysis by the law firm Mayer Brown that found new tariffs on solar products would result in a net increase of at least 114,800 jobs across all segments of the U.S. solar industry. Werner was among half a dozen solar company executives who testified that Suniva and SolarWorld brought their recent financial collapses upon themselves. Presidents and CEOs took turns describing their dealings with the two companies, recounting late deliveries, subpar panel efficiency and recalls on faulty panels. More than 25 witnesses testified against the proposed tariffs, including state lawmakers from Minnesota, North Carolina and Maryland. “Minnesotans benefit enormously from the solar trade with Canada,” said Sen. David Tomassoni, noting an Ontario-based solar producer, Heliene Inc., that employs workers in the state’s Iron Range. “Operations like Heliene’s…will no longer have access to vital components, and Minnesotans will suffer the consequences,” he said. North Carolina Rep. Jason Saine said solar growth played a key role in helping his state attract $9 billion in investment over the past 10 years, which has especially benefited poorer counties. A bipartisan group of 16 senators and 53 members of the House of Representatives sent open letters to Commission Chairman Rhonda Schmidtlein urging the commission to reject the petition. “We respectfully request that the commission carefully consider the potential negative impact that the high tariffs and minimum prices requested would have on the tens of thousands of solar workers in our states and on the hundreds of companies that employ them,” the letters state. Several conservative free-market groups have also joined with SEIA to fight against protectionist trade measures. Representatives from the Embassy of Canada and the Embassy of Mexico testified against the petition, saying the two countries should be excluded from duties because they don’t supply a significant percentage of solar imports. Georgia-based Suniva filed the original petition under Section 201 of the 1974 Trade Act, which is an obscure part of U.S. trade law that could allow the president to implement tariffs, minimum prices or quotas on solar products from anywhere in the world if the ITC finds "serious injury." SolarWorld, a German company with U.S. manufacturing operations in Oregon, joined the petition in May. “What inspired Suniva and then SolarWorld to revive the use of the dormant Section 201 global safeguard law?” asked Vice Chairman David S. Johanson, noting it had not been used in a case since 2001. SolarWorld lawyer Timothy Brightbill responded that anti-dumping laws implemented against China and Taiwan in 2015 had failed to address the industry’s downturn, and Chinese producers were “openly boasting” about how easy it was to set up solar manufacturing operations in other countries to circumvent the duty orders. Todd Baylson, 41, who traveled from Philadelphia to attend the hearing, says the petition has “introduced uncertainty” at Solar States, an installation company where he works in business development. The ITC is expected to issue a decision in September. If trade officials decide that imports have caused "serious injury" to domestic solar manufacturers, they will recommend remedies to President Trump, who has spoken extensively about protecting U.S. manufacturing jobs. The final decision to accept, change or reject the ITC’s recommendation will be up to him.